I recently announced a storytelling project I’m working on called My Favorite Joburg People. I chose four people in Joburg, each of whom has an amazing story to tell, and interviewed them and shot their portraits. I’ll be presenting the stories and portraits at an upcoming event called Translating Joburg – Storytellers, and also publishing them on my blog. This is the second of the four stories. These stories are longer than my normal blog posts. James on the street near his home in Yeoville, May 2016. I’ve played a lot of sports and I’ve had a lot of coaches. I know what a great coach is made of. Great coaches motivate us without crushing our spirits. Great coaches push us to go farther than we can go alone. Great coaches have an ego; they want us to achieve so that they can achieve themselves. Great coaches want to be the best and they want the best for their athletes. Great coaches make us feel like no matter how good we are, that we can always be better. And we do get better, because we want to make our coaches proud. James Ike is a great coach. 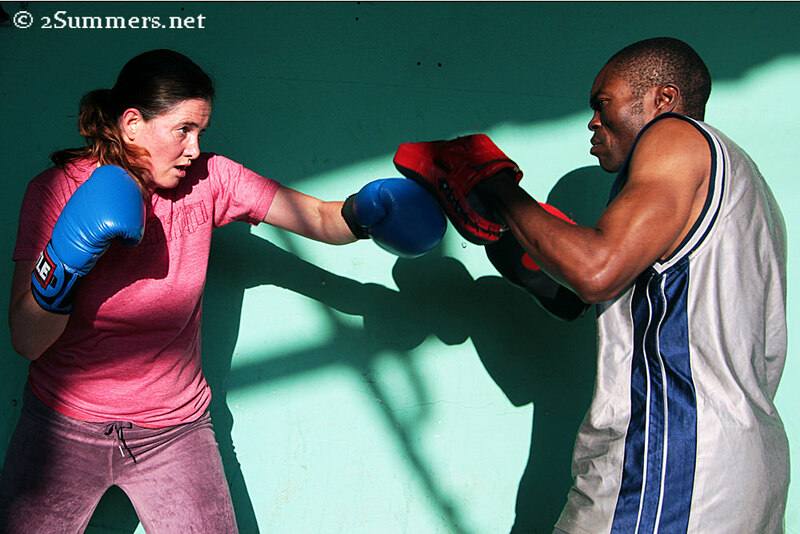 In 2012 I started training at the Hillbrow Boxing Club (HBC), where James was a trainer along with Coach George Khosi. From the moment I arrived at the gym, I yearned for James’ approval. “DON’T MISS MY TARGET!” he barked during one of our first padwork sessions. From then on, I rarely missed the target. James started to trust me and to teach me boxing in earnest. Nowadays, the guys lifting weights sometimes stop and stare at James and me as we dance across the floor. James whacks the side of my head when I let my guard down. I dodge his swings and try to knock him over with my left cross. The guys laugh and applaud. James pretends to ignore them, but he loves it. He’s proud of me and all the other people he coaches. James shuns the limelight at the HBC, avoiding the stream of photographers, filmmakers, and journalists who frequent the gym. George is the face of the HBC – everyone knows George. But very few know James. This is my chance to change that. On the day of our interview, I sit in a chair in James’ one-room apartment, watching him prepare his dinner between afternoon and evening training sessions. T.B. Joshua, a Nigerian television evangelist, performs miracles in the background. I ask James to turn down the volume. James has a lilting, lyrical way of speaking and he arranges his words in unexpected ways. When I ask him questions, his answers float in slow circles, nipping at the spot in the center where the real truth lies. Sometimes I have to read between the lines, venture guesses. I’ll do my best to tell his story as I understand it. James, whose Igbo name is Emeka, was born in Nigeria in 1966. He was the first of seven children and the family’s business was in northern Nigeria, in a city called Kaduna. But James’ parents fled from Kaduna to their home village in the southeast, Old Umuahia, just before James’ birth. James’ family is Igbo – the ethnic group based in southeastern Nigeria that attempted to secede from the country during the Nigerian Civil War (also called the Biafran War). The Igbo living in northern Nigeria were badly persecuted during this time, which is why James’ parents left. Despite the brutality of this war, which James has little memory of, his family survived intact. They moved back to Kaduna as soon as the war ended, when James was four years old. James’ family moved around to several different states in northern Nigeria, which was (and still is) dominated by an Islamic people called the Hausa. Today, many of these states are affected by the terrorist group Boko Haram. James and his family, as Igbo Christians, were in the minority. I ask James if he ever experienced violence because of his ethnic heritage. He doesn’t answer directly. James lived with his parents until he was 14, when he left for boarding school in Plateau State. Things went well at first, but then tragedy struck. I ask James how his mother died. He takes a deep breath. James’ mother was riding in a car that collided with a herd of cattle. The death of James’ mother, whose name was Chidi, was a turning point. “Life wasn’t sweet with me again, because she was my pillar. My mom was my champion. I am her first born, she wants me to be the first and she wants me to get the best. She took me to a faraway school, an expensive school, so I can get the best of knowledge. 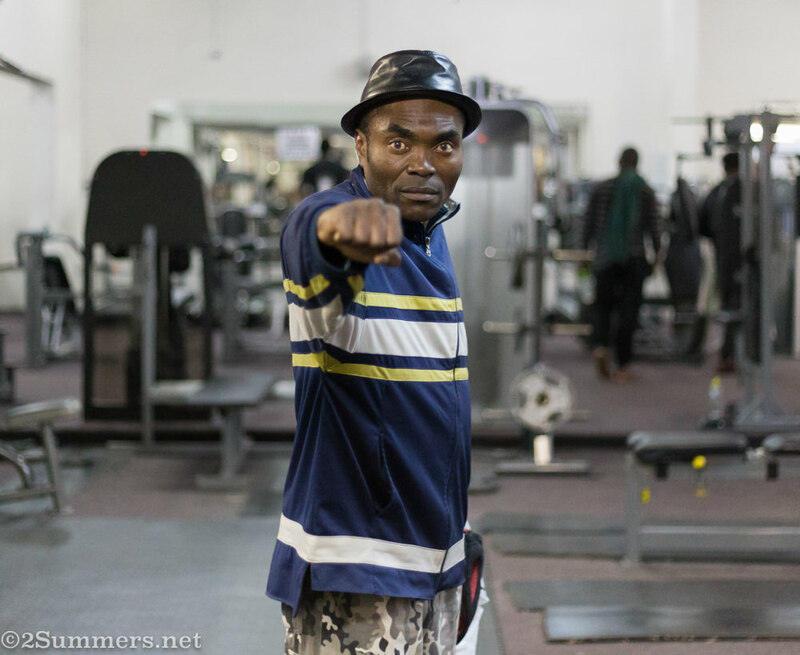 Soon after returning to Yola James met his first boxing coach – a man called Chico. “He lived a little way from my home. I saw him passing by with gloves, and I helped him to carry gloves. I used to time him – each time he was passing, I helped him.” Soon, James was boxing. James finished high school and got a job at the sports council in Benue State, working as a performing athlete and an assistant coach. James has always excelled at teaching others how to box. James moved through the amateur ranks as a boxer. But looking back, he realizes something was missing. Boxing is about money and politics, as much as athletic achievement. The decision on who wins a fight is often subjective – decided by judges who may or may not be biased. So he bided his time. In 1992, James was the number-one-ranked amateur boxer in the country. But he couldn’t find the right moment to make his move. Eventually though, James’ work contract ran out and he had to leave Benue State. “There was no way out,” James said, “if not through professional boxing.” He moved to Lagos, hoping to find his way. James had to start from scratch in Lagos. But he eventually hooked up with a respected boxing coach called White Horse. “We started working hand in hand – I started assisting him.” Together with White Horse, James trained Bash Ali, a former World Boxing Council International Cruiserweight champion. James, who by this time was known as Kodo, or “the General”, began to establish himself in Lagos. Eventually James was invited to fight on Bash Ali’s undercard, and he agreed. After 17 years of fighting amateur, James turned pro in 1999. James fought as a professional in Nigeria and he did well, traveling throughout Africa and winning. But he never made it across the ocean to the glitzy arenas of Las Vegas, as some of his teammates did. James visited South Africa a few times during his professional fighting days; his final loss was in South Africa in 2006. A couple of years later, while still working for White Horse, James returned to South Africa accompanying another Nigerian fighter. After the fight, James stayed in Johannesburg and he has never gone back. 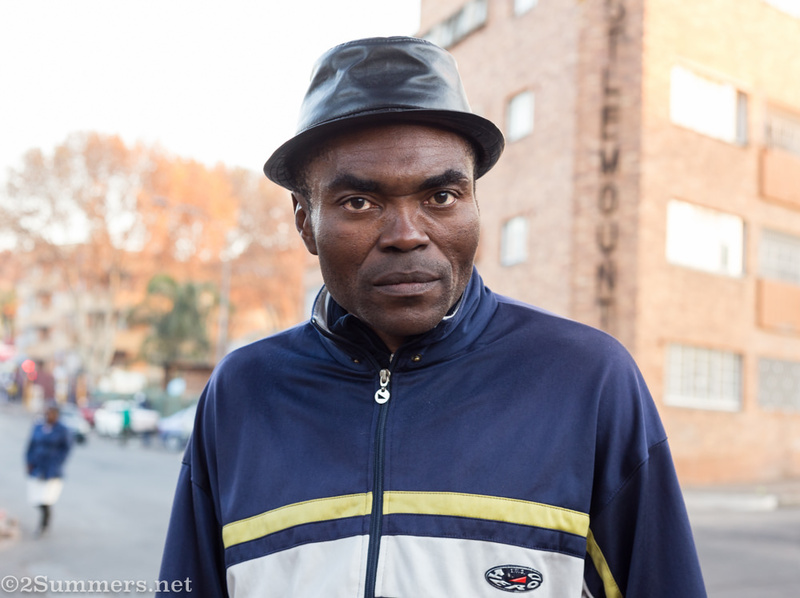 James on Pretoria Street in Hillbrow, May 2016. I’m trying to understand what prompted James, who had lived his entire life in Nigeria, to suddenly relocate to the other end of the continent. (I suppose it should have been easy for me to understand, as I did basically the same thing. But I digress.) James is trying to explain. “We Nigerians, we don’t believe in staying in one place, especially home. We want to go out…Home is not a big deal. You don’t try to be the least, you must try to be among the best, to be among the recognized ones. James was 40 years old and hadn’t achieved what he wanted in Nigeria. He wanted to “go out”: to make his fortune so he could return home as one of “the recognized ones”. In 2009, after a few previous visits as a professional boxer, James wanted to give life a try in Johannesburg. He had retired from professional boxing and wanted to pursue other business. “I decided, let me try some deals here. I tried, I tried, I tried. I did some trading, I traded on clothes, I traded on food. I started going to flea markets, I tried all those kinds of businesses…It didn’t work. James and I have been talking for quite a while now, and I realize something is missing. James stops for a moment, thinking. The lady’s name was Philomena. Philomena didn’t go to Italy in the end, but she did leave Nigeria. James considered following Philomena to Spain, and later he tried to convince her to join him in South Africa. But neither happened. James eventually broke off communication with Philomena. I ask him if he thinks he’ll ever see her again. Yes. Life is like that sometimes. James had known George Khosi, a legendary boxer in his own right, since one of his first visits to South Africa as a hotshot professional in the early 2000s. James was well known in Johannesburg’s boxing circles at that time. James joined George at the HBC, an abandoned petrol station in the center of Hillbrow that George had fashioned into a makeshift gym. The HBC is a far cry from the nice Joburg hotels where James used to stay. George lives in the gym’s basement with several other guys, in a dim, cavernous room separated by sheets hung from the ceiling. It wasn’t an ideal home. But James’ options were limited, and he saw potential in the HBC. I know what James means. I’ve trained at the HBC for years and I care deeply for George, as I would care for a favorite uncle. 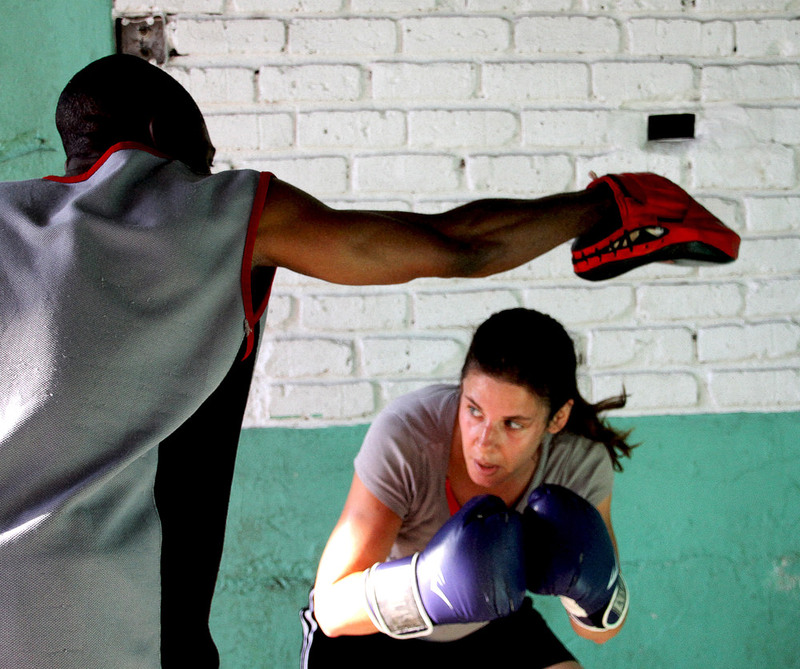 I love to exercise in that environment – it’s perfect for a boxing hobbyist like me. But the Hillbrow Boxing Club is what it is, and it will never be more. It wasn’t the place for James’ ambition. 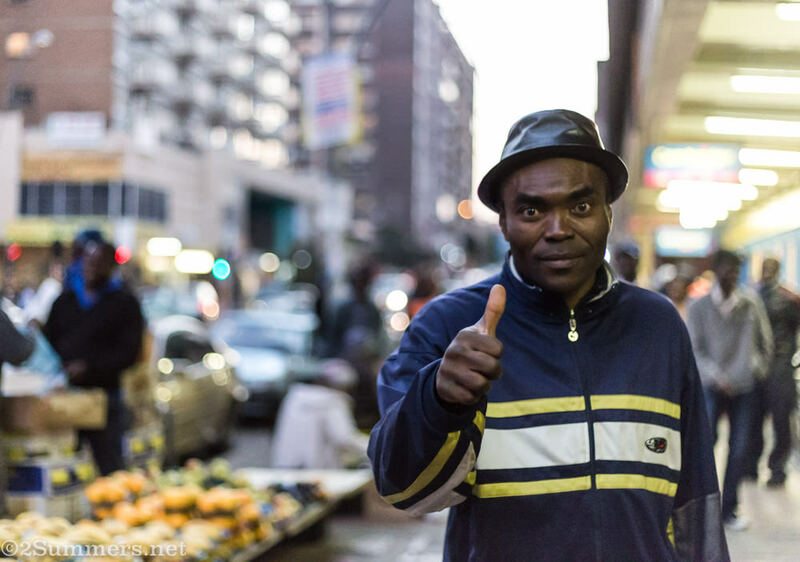 “I think I’ve finished my assignment there,” James says of the Hillbrow Boxing Club. He’s on his own again. In 2013, James began to train athletes independently and saved enough money to rent a room of his own in Yeoville. Today, James does most of his training at the Bronx Gym, a more conventional gym up the road from the HBC. He works three mornings a week at the HBC, but that’s mainly because of me and some other friends of mine who box there. We still like to train at the HBC, and James is a loyal coach. James at the Bronx Gym, May 2016. Johannesburg isn’t an easy place for African immigrants. And Nigerian immigrants – fairly or unfairly – have a particularly bad reputation in Joburg. I want to know how James deals with the discrimination that I suspect he must face on a regular basis. James is walking a narrow tightrope – trying to integrate into South African society, but only to a point. Trying to blend in, but also protecting himself by staying on the outskirts of both South African culture and his own. If you’re South African, then you’ll understand what James is getting at. Nigerians in South Africa are stereotyped as criminals: drug lords, pimps, fraudsters. And in some cases it’s true. There are many Nigerian-run crime rings in Joburg, especially in Hillbrow. I can imagine how hard it must be for James to distance himself from these stereotypes in the eyes of South Africans, without being seen as a traitor to his fellow Nigerians. “What is your dream?” I ask James. I ask James if there is anything in his life that he wishes had gone differently. “Things have not actually gone perfectly, the way I envisioned, the way I desired it to be. I won’t say that things are falling apart, but things have not gone perfectly. I’m still hoping for the best, and that’s the story. I also believe that James’ time is coming. He’ll be 50 this year and I doubt there is a healthier 50-year-old in all of South Africa. James’s mind is as strong as his body. James is training several boxers now – professionals, amateurs, and hobbyists like me. I think he can continue to grow his business and become a “recognized one”. I still think James can make it, and return to Nigeria in the position he wants to be in. He is, after all, a great coach. My all-time favorite picture of James, training with my friend Henrike in March 2013. Thanks to James for telling his story, and for being a great coach. If you’re interested in training with James, you can reach him at 083-982-8785. Read all of the My Favorite Joburg People posts. Wow. That was an amazing read about an amazing person. Thanks for sharing. Thank you for the insights. I always enjoy your style of storytelling. Thanks so much, Clifford. I hope you’re doing well. beautiful stories, I am looking forward to the next 2, thanks! What a fantastic biography! I got to learn more about two cultures and one continent while reading an absorbing story about an interesting person. Thanks to you and James. He must like you quite a bit to be put in the spotlight after shying away from attention. I don’t know if I’d like to watch a video of myself training. I’m afraid I’d discover I’m not as good as I think I am. That last option is the most likely. Spoken wisely by someone who obviously has experience watching herself dance on video. You know it. Painful as all hell. Great storytelling…..you are almost developing your own genre! The Sunday Times (UK) run a series in the magazine section called ‘A Day in the Life of..’ And tell the story of some noteworthy person’s normal sort of day. It is very popular and is available in book form. I’m sure you could do something similar. People love reading about other peoples’ life stories…..even the ordinary (which of course they are’nt). Thanks Pamela! Hope you’re doing well. It was a pleasure to ‘meet’ James and read about his life. I wish him the best. Thanks Genie! Hope you’re doing well. You are such an amazing writer, I know James very well. When I started Boxing in 2003/2004, he was there and advised me on so many thing. He gave advise from my fighting style to the type of running shoes I should wear. A really amazing writeup here, its wonderful. Here’s my name on instagram, show it to him @officialshawnrapha. I am sure he will remember me, what an amazing write up, I mean I couldn’t take my eyes of your page. “He knew me by different names back then, he has to see my page to recognize me. I trained with White Horse. Shawn, thanks so much for the message! Sorry it took me so long to respond. It’s so cool that you used to train with James and found my post. I will definitely tell him about you. All the best. Yes, that’s my instagram account.